A Saturday, October 11, 2008 Associated Press story detailed how Alaska Governor Sarah Palin had "bonded" church and state, spending more than $13,000 dollars in state money to attend religious events and meetings with Christian pastors since Palin took office in 2006. During that period, Sarah Palin was listed, and still is, as being on the advisory board of a publicly supported Christian nonprofit which states on its tax records its mission is evangelizing and runs "Religion related - spiritual development" suicide prevention programs in Alaskan public schools. In the year 2000, Wasilla, Alaska mayor Sarah Palin joined the advisory board of Carry the Cure, Inc., a 501(c)(3) suicide-prevention nonprofit which has received tax-exempt public and private funds for running suicide prevention programs in schools and churches but has declared, on its 2000 to 2006 federal tax returns, its organizational mission to be “Religious - Evangelism”. Both William Pagaran, Carry the Cure’s current president, and Pat Donelson, its cofounder and former president, are licensed ministers through Northwind Global Ministries, which Donelson currently directs. Northwind promotes “Joel’s Army” doctrine, that an end-time army of young Christians endowed with supernatural powers will conquer and purify the Earth. 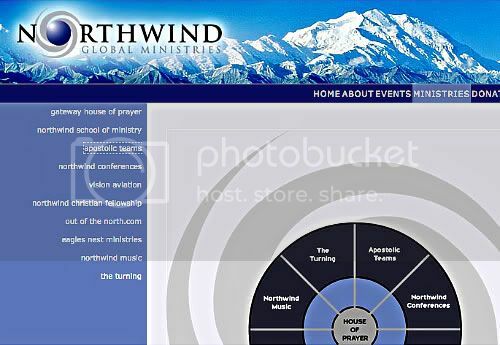 Northwind Global Ministries is closely linked to a fast growing, anti-denominational movement within Christianity, highly controversial among Christian conservatives, known as the New Apostolic Reformation, which characterizes the Catholic Church, all Protestant Christian denominations, and competing religious and philosophical belief systems as invalid and under demonic influence. In early 2008, while still listed on Carry the Cure’s advisory board, Alaska Governor Sarah Palin appointed Patrick Donelson, listed on Carry the Cure’s available tax records as Carry the Cure President up through 2006, to a four year position on the Alaska State Suicide Prevention Council, a position which would allow him to make recommendations on how Alaska State suicide prevention grant money is used. A December 26th, 2007, announcement from the office of Alaska Governor Sarah Palin noting the appointment cited, among his qualifications for being on the Alaska State Suicide Prevention Council, Rev. Pat Donelson’s “extensive experience” of eight years of “work in drug, alcohol and suicide prevention” as cofounder and president of Carry the Cure, Inc.
Donelson, a former youth director for the Alaska District Assemblies of God who also works as a fishing guide, is a founding member and the current director of Northwind Global Ministries and ran its school of ministry from 2000 to 2006. 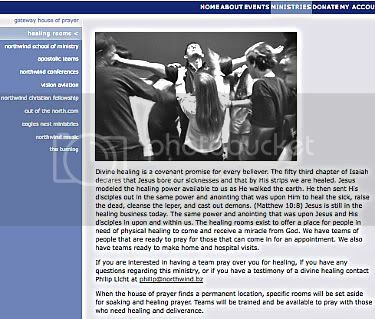 Northwind’s web site states that Christian believers have miraculous powers for healing, cleansing lepers, casting out demons, and raising the dead. Although Donelson is officially an Assemblies of God minister, many of the doctrines he has promoted through Northwind Global Ministries were denounced in 2000, by the General Council of the Assemblies of God, as "deviant practices" in "Endtime Revival–Spirit-Led and Spirit-Controlled, A Response Paper to Resolution 16.". On its tax forms since 2003, Carry the Cure has described its suicide prevention programs as providing “Religion related - Spiritual development”. As currently stated on its web site, Carry the Cure holds that “Jesus and His church are the greatest resources for people who are hopeless, depressed, desperate or in need and that no safety net is complete without them”. From 1991 to 2004, Alaska had the highest suicide rate of any state in the US. While Alaska’s suicide rate dipped slightly in 2005, so that Alaska had only the 3rd highest suicide rate of all US states, its suicide rate has not changed significantly overall since 1995, as detailed in a February 2007 report on suicide in Alaska prepared for the Suicide Prevention Council and other relevant state agencies. Under Pat Donelson’s leadership, Northwind Global Ministries has promoted controversial evangelist Todd Bentley, whose violent rhetoric defines one of the most extreme, militant tendency in the New Apostolic Reformation; “Joel’s Army” theology prophesies that an end-time, last-generation army of young Christians endowed with supernatural powers will cleanse the Earth of evil and establish Christian dominion. Todd Bentley is the subject of a Fall 2008 Southern Poverty Law Center story, Arming For Armageddon by researcher Casey Sanchez. As shown in the 2006 academy award-nominated video documentary by Rachel Grady and Heidi Ewing, Jesus Camp, some Christians who hold such views are actively indoctrinating their children with the belief that they will become soldiers in that end-time army. Carry the Cure was founded in 1996, as described on its web site, by Pat Donelson and Doug Yates, currently a pastor at the Skyline Foursquare Church in Anchorage Alaska, “in response to Western Alaska's outcry against the epidemic of suicide among Native Teens” to “provide a message of hope through school rallies, mentorship, and education.” Carry the Cure also declares, on its web site, that “[t]through innovative, creative, & unique workshops & events, Carry the Cure is dedicated to the eradication of youth suicide and substance abuse”. In an interview published in a February 14, 2008, Anchorage Daily News story concerning his appointment by Sarah Palin to the Suicide Prevention Council, Pat Donelson told reporter Melodie Wright that he "was pleasantly surprised to see the advances at the state level compared to 10 years ago. Back then, it was more throw money at programs, more outcome based. When we received any funding, the constraints were so narrow and the reporting we had to give was so narrowly focused it made it difficult to deal with suicide prevention effectively - that's my opinion." "We are committed to building the kingdom of God one heart at a time. We hold youth rallies and outreaches in hopes of connecting the lost to the church, as well as, equipping the church to connect with the lost. . .
We believe that Jesus and His church are the greatest resources for people who are hopeless, depressed, desperate or in need and that no safety net is complete without them." Melodie Wright's Anchorage Daily News story described Carry the Cure as "a faith-based nonprofit organization that aims to stem the tide of suicide among teenagers." However, the highest rate of suicide in Alaska, by far, is not among teenagers but young adults from 20 to 29 years old. In any case, by its own description suicide prevention has been a secondary priority for Carry the Cure. A letter of recommendation, written for Carry the Cure and currently posted on its web site, from current Carry the Cure President William Pagaran's pastor Chris Savino, states that "[t]o the best of my knowledge, Carry the Cure takes the life giving message of Jesus Christ to those who do not know it." Judging by statements made on Carry the Cure's 990 and 990EZ IRS tax returns filed from 2000 through 2006, Carry the Cure's president during that period, Pat Donelson, considered the public and private, tax-exempt funding money his organization received in that six-year time period, for suicide prevention programs, as money his ministry could use primarily for evangelizing - with suicide prevention relegated to secondary priority. From 2000 through 2002, on 990EZ tax return forms Carry the Cure, Inc. filed with the IRS, the organization used the same generic description of its yearly suicide prevention program service accomplishments: "[t]he Committed to Life program reached... public junior and senior high schools with drug, alcohol and suicide prevention assemblies. Committed to Life used Bible college students in the production of these assemblies." In 2000 and 2001, Carry the Cure performed a total of 12 public school assemblies. In 2002, its period of heaviest funding for public school suicide prevention, Carry the Cure performed, at a cost of 68,500 dollars, "several" public school assemblies. In 2002, the only year in the 2000 to 2006 period for which Carry The Cure, Inc. filed a 990 tax return that details the specific dollar amount of government grant money the charity received, Carry the Cure states lists its government grant total as 55,600 dollars. "I am pleased to write a letter of support on behalf of your exciting and worthy organization that positively impacts our community by educating and enabling local young people and their families with truth-based skills that can help them overcome problems that could potentially destroy their lives." "Last November Northwind Global Ministries led a group of 48 youth, young adults, and leaders from Alaska to Albany, Oregon to participate in the first ever Joel's Army conferences sponsored by Fresh Fire Ministries. It was held at the Albany Vineyard Christian Fellowship and hundreds of people came from all over the United States, Canada, as well as several other nations. We were compelled to go and be a part of this gathering because for years we have been hearing the prophets tell of a day that will come soon when the Lord will raise up an end time army known as `Joel's Army'. We felt an urgency from the Lord to go and stand in for Alaska and to say to heaven, `Don't pass us by, we want Alaska to be a part of this end time harvest.' "
"While considering your visit I must admit I had concerns regarding First Amendment issues, in that we are a public school; however, your presentation was organized exquisitely to impart to our students the essence of your message without infringing on `separation' protections. Our kids were delighted by your visit. . . They were as attentive as I have seen them in the year and a half I have been in Akiak." "To the best of my understanding, Carry the Cure takes the life-giving message of Jesus Christ to those who do not know it... [o]f late, an exciting development is that they have been given opportunity to speak in the public schools of the Matanuska-Susitna borough with their "Committed to Life" program." In 2003, as if its IRS tax form declaration, that religious evangelism was Carry the Cure's organizational mission, had not been not sufficiently emphatic, Carry the Cure tacked on, in front of descriptions of its yearly state-funded suicide prevention program service accomplishments: "Religion related, Spiritual development." "We Will Fight For Revolution"
Currently Carry the Cure's President and leader of its public school presentations for most of their existence, William Pagaran is a gifted percussionist who has played with the Alaska State Orchestra and provided the dynamic force for Carry the Cure's suicide prevention school programs. As shown in sample footage from the Carry the Cure web site, Pagaran's events can be rhythm driven and fast-paced, featuring audience participation in "Stomp! "-like percussion ensemble drumming, highly competent heavy metal rock, soloist vocal performances, and high-energy pep talks in which Pagaran tells his public school audiences "you have a destiny, there's a plan for your life!" Beyond its flagship musical extravaganza show, the group also offers schools a range of workshops such as a sexual abstinence training that "helps students to save themselves for their future spouse and keep them safe from teenage pregnancy or STD's." Other workshops include training on warning signs of suicidal behaviors and on conflict resolution. One workshop is "[d]esigned to empower a man to be a real man - one of courage, purity, character, and integrity." "Carry The Cure believes in this generation... It's time for the light of truth to invade the darkness. It's time for this generation to rise up and take their rightful place, a place of victory instead of defeat, of hope instead of despair, of purpose instead of emptiness." Carry the Cure's web site has several video clips from Rhythms of Life presentations and one, described as `live music presentation with a full band expressing lyrics that include the message of "Committing to Life" `, seems represent something very different - a call for violent change. "I hear the call, the call of destiny. I hear the call, the call that sets me free. So take me and my generation, we will fight for revolution. Take me and my generation, we will fight for revolution." `The word apostle literally means "sent one." We know from the scripture that Jesus called His disciples to Him and gave them authority to go and proclaim the Gospel of the Kingdom with accompanying miracles and power. The Lord is still calling disciples to Himself and giving them authority to go and do these things and even greater things. Ministry teams are sent out from NGM on a regular basis. . . to minister in a variety of ways such as preaching, teaching, worship ministry, prayer and intercession, practical helps, and church and house of prayer planting. They also minister in public school assemblies, leadership seminars, and workshops.' The Northwind description indicates these teams may sometimes work miracles. "Carry The Cure is sometimes asked to bring all or part of a team to help with evangelism and outreach with local area churches. . .
We are not ashamed of the gospel, because it is the power of God for the salvation of everyone who believes (Romans 1:16). . .
We offer Evangelistic Outreach, Christian Workshops, Youth Rallies, Youth Leadership Training, Worship Workshops, Evangelistic/Soul Winning Training and much, much more..."
Sarah Palin's affiliation with Carry the Cure and Pat Donelson, and by extension with Northwind Global Ministries, provides substantiating evidence, beyond Palin's extensive links, especially through the Wasilla Assembly of God tying Palin to an emergent, evolving religious movement only dimly perceived by the American left but which has for years been wildly controversial among American Christian conservatives, the New Apostolic Reformation. That passage from Ephesians has traditionally been taken to refer to Jesus Christ's' historic delegation of authority such that the age of Apostles and Prophets, and the types of miracles ascribed to Jesus Christ in the New Testament, are two millennia in the past. The New Apostolic Movement rejects that traditional doctrine, known as cessationism, and asserts that now, in the end-time, we have entered into a second age of apostles and prophets, and Christian miracle-working. Through the doctrine of the Five-Fold Ministry of Prophets, Apostles, Evangelists, Pastors and Teachers, the New Apostolic Reformation, with the burgeoning Apostolic, prophetic and "spiritual warfare" networks of church-growth specialist C. Peter Wagner in the vanguard, is rapidly growing as it undermines traditional church and denominational structures. C. Peter Wagner is the self-declared top apostle of the New Apostolic Reformation and lists, under his authority in his International Coalition of Apostles, five hundred evangelists, some of whom have anywhere from several up to hundreds of ministries that are in turn under their apostolic authority. Wagner's apostolic network is one of the largest in the New Apostolic Reformation but it is only one out of many emerging Apostolic Networks. "That the fruits, gifts, ministry, and demonstration of the Holy Spirit's power operates fully today. That His anointing and power manifesting in the church and through every believer is essential for the Gospel of the Kingdom to be proclaimed and for believers to live a sanctified and holy life." The belief that all Christians can learn to work the sorts of miracles ascribed to Jesus Christ in the New Testament, such as miraculous healing and raising from the dead, is a central pillar of New Apostolic movement belief. "Divine healing is a covenant promise for every believer. The fifty third chapter of Isaiah declares that Jesus bore our sicknesses and that by His strips we are healed. Jesus modeled the healing power available to us as He walked the earth. He then sent His disciples out in the same power and anointing that was upon Him to heal the sick, raise the dead, cleanse the leper, and cast out demons. (Matthew 10:8) Jesus is still in the healing business today. The same power and anointing that was upon Jesus and His disciples in upon and within us." 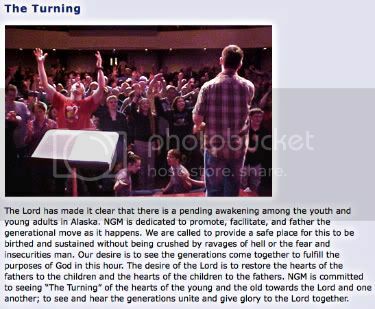 As shown in pictures on its web site, Northwind Global Ministries has held conferences at the Wasilla Assembly of God, which Carry the Cure, Inc. also lists as a supporter. In turn, Wasilla Assembly of God head pastor Ed Kalnins has discussed, in numerous sermons, his belief that Christians can perform miraculous healing. 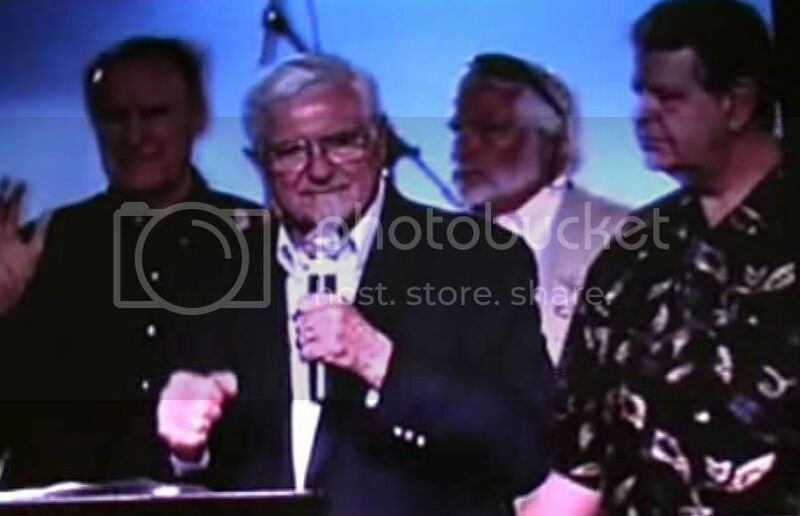 In a May 25th, 2008 Wasilla Assembly of God sermon entitled "Pastor Ed's Lakeland Report", Kalnins describes attending Todd Bentley's "Lakeland Outpouring" in Lakeland, Florida and contrasts that event with the more participatory atmosphere at Rick Joyner's Morningstar Ministries, at which, Kalnins describes, he witnessed a tumor being miraculously removed from a man's face. In the same sermon, Kalnins relates an account of a baby, dead for three days, being brought back to life through prayer. In an August 3, 2008 sermon given at the Wasilla Assembly of God, Ed Kalnins told his church members that "I could impart into you a supernatural gift but ultimately you have got to have the truth of the word of God to sustain what you just received." Palin's Churches, Thomas Muthee, Witchcraft and The Third Wave from Bruce Wilson on Vimeo. Ed Kalnins has declared his belief in other core New Apostolic Reformation doctrines, such as the Five Fold Ministry. In his January 20, 2008 introduction prior to a sermon by Pastor Scott Philips, Ed Kalnins stated, "I believe in Five Fold Ministry, I don't believe in a personality driven church, I don't believe in it. I believe in authority-led church, God's government leading the way. . . there is an apostle over every church, and it just so happens that I'm called." 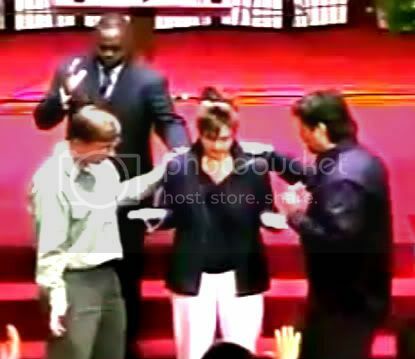 In 2002, according to a writing of Todd Bentley's posted on Northwind's front page, Northwind Global Ministries, under Pat Donelson's management, led a group which visited a Fresh Fire ministry conference hosted by controversial evangelist Todd Bentley, whose style of faith healing has often involved Bentley violently assaulting on stage those he claimed to be curing. Bentley promotes the idea of Joel's Army", perhaps the most militant theological component of the New Apostolic Reformation. "An end-time army has one common purpose -- to aggressively take ground for the kingdom of God under the authority of Jesus Christ, the Dread Champion. The trumpet is sounding, calling on-fire, revolutionary believers to enlist in Joel's Army. ... Many are now ready to be mobilized to establish and advance God's kingdom on earth." "This is an end-time army... "
"Joel tells of an end-time army of the LORD that has been termed by many as Joel's Army. Joel characterizes the army's attributes and describes it's resulting affects and then says, "It will come about after this that I will pour out My Spirit on all mankind." This is an end-time army that will be a part of the greatest move of God. The Spirit of God will be poured out upon these saints like never before and they will see the glory of the LORD fill the entire earth." I also decree that a new supernatural strength will flow through this ministry. A new life force will penetrate this move of God. Government will be established to set things in their proper order." Shortly after his "commissioning", Todd Bentley was disgraced, in the eyes of many of his followers, due to a divorce from his wife amidst revelations from the Board of Directors of Bentley's Fresh Fire Ministries that Bentley had "entered into an unhealthy relationship on an emotional level with a female member of his staff". The Northwind Global Ministries web site links to an astonishing roster of top members of C. Peter Wagner's networks: seven members from Wagner's Apostolic Council of Prophetic Elders and three members from Wagner's International Coalition of Apostles, two of whom are based in Alaska. Windwalker's International founder Mary Glazier is in both of those networks and at a June 12-14, 2008, New Apostolic Reformation conference held in Everett Washington Glazier told C. Peter Wagner and other top New Apostolic Reformation leaders that it was shortly after a 24-year old woman named Sarah Palin joined Glazier's prayer group that Palin decided to go into politics. After hearing the news, Wagner apostle Norwegian minister Jan-Aage Torp wrote excitedly that Sarah Palin was a "Prayer Warrior" and noted an interesting fact Torp said had not received US media attention - that, under Mary Glazier, Sarah Palin is in one of C. Peter Wagner's prayer networks. Mary Glazier is the Alaska Director of C. Peter Wagner's U.S. Strategic Prayer Network, formerly known as the "U.S. Spiritual Warfare Network". "Spiritual Mapping" and "Spiritual Warfare" play key roles in the New Apostolic Reformation. Through Spiritual Mapping, which C. Peter Wagner has also described as a form spying, followers of the New Apostolic Reformation create detailed intelligence reports on spiritual opposition they perceive in their local cities and towns. In his book “Breaking Spiritual Strongholds in Your City”, Wagner encouraged readers to map out the locations of “high places, altars, temples, monuments or buildings associated with witchcraft, occult, fortune-telling, satanism, Freemasonry, Mormonism, Eastern Religions, Jehovah’s Witnesses and the like.” Wagner also suggests his readers detail compile information on local religious and political leadership, noting receptiveness to, or hostility towards, New Apostolic Reformation ideas. `Spiritual Mapping' and `Spiritual Warfare' concepts were covered in 1999 the Christian Science Monitor article by Jane Lampman and also to some extent in a November 2006 Harpers Magazine article by Jeff Sharlet, "Soldiers of Christ; Inside America's Most Powerful Megachurch". Through "spiritual warfare", practitioners drive out those demons, from towns, cities or geographic regions, which otherwise would hinder all meaningful human progress. Brazil is a Catholic Stronghold but People Are Getting Saved Anyway! 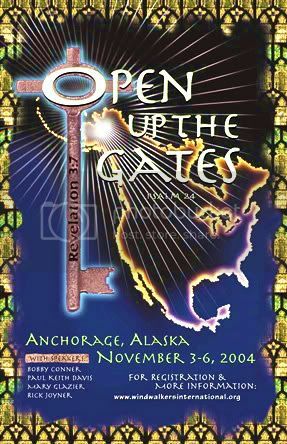 In November 2004, Northwind Global Ministries co-sponsored an Anchorage conference, entitled “Open up the Gates”, at which Mary Glazier was one of the keynote speakers. Another leader of C. Peter Wagner’s prayer networks, Thomas Muthee, anointed Sarah Palin, as a political leader, in an October 2005 religious ceremony held at the Wasilla Assembly of God in Wasilla, Alaska, where Palin was re-baptised at twelve and attended church for over two and a half decades. 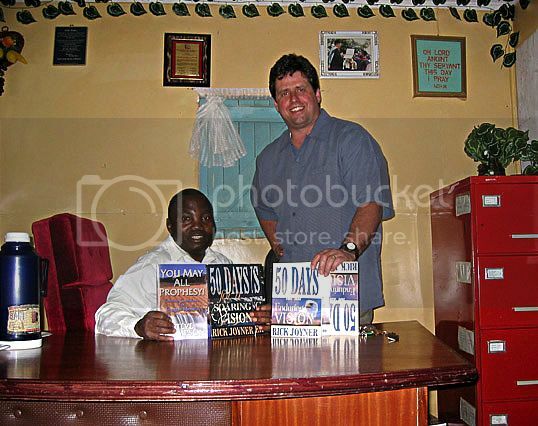 A little over a year prior to the anointing ceremony, on On March 14, 2004, Thomas Muthee told congregants at the United Kingdom based Kingsgate Community Church that "places like Brazil, they are Catholic strongholds, but people are getting saved anyway!" C. Peter Wagner has written that Thomas Muthee is a "close friend', and in his 2005 book "Freedom From the Religious Spirit", on page 22, Wagner wrote, "The spirit of religion in the Roman Catholic Church for centuries linked with the political spirit in Latin America and effectively prevented the spread of the Gospel. Once this was broken evangelical churches began to mushroom." Another leader in C. Peter Wagner's Strategic Prayer Network, Florida and Southeast Region Strategic Prayer Network Diane Buker, maintains an extensive section on her web site attacking the Catholic Church, along with Mormonism, Scientology and Freemasonry, as a "corrupt religious system". The New Apostolic Reformation considers all competing religious and philosophical belief systems, as well as all denominational and church structures within Christianity, to be invalid and even under demonic influence. To followers of the New Apostolic Reformation, Thomas Muthee has become an international celebrity, in demand at New Apostolic conferences and events, because of his role in a series of videos, by George Otis Jr., which purport to document four case studies in which "spiritual warfare" effects miraculous social transformation. The Transformations (#1) video presents Muthee's claim to have dramatically cut crime and addiction in the Nairobi, Kenya suburb of Kiambu by exorcising a "spirit of witchcraft" and by inciting a mob of his followers to hound an elderly Christian woman, accused of witchcraft, out of town. During his October 2005 anointing of Sarah Palin, Thomas Muthee called on God to protect Sarah Palin against “spirits of witchcraft”. As told in an article published in Charisma Magazine, Mary Glazier claims to have driven a woman accused of witchcraft out of Alaska through a campaign of “spiritual warfare”. 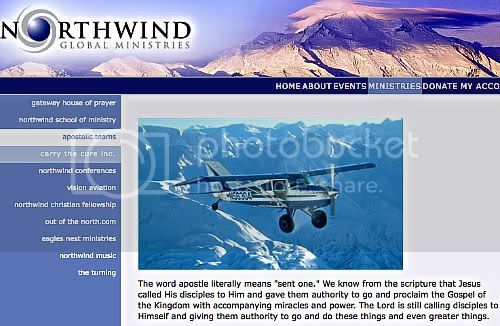 Carry the Cure, Inc. lists the Wasilla Assembly of God as one of its supporters, and Northwind Global Ministries, as shown on its web site, holds conferences at the Wasilla Assembly of God as well. 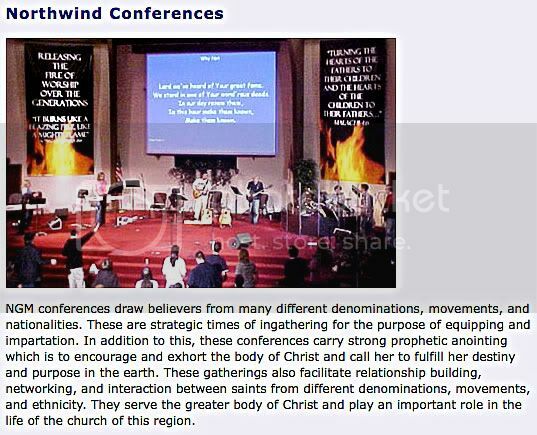 As evidenced in numerous writings and statement of belief posted on the Northwind ministry web site, Northwind Global Ministries endorses and promotes New Apostolic Reformation doctrines, and numerous recorded statements made by Wasilla Assembly of God head pastor Ed Kalnins and also by Kalnins’ subordinate pastors, indicate those doctrines are taught at the Wasilla Assembly of God as well. "At first it may seem like totalitarianism... "
A central tenet of the New Apostolic Reformation holds that the expulsion of “territorial” demons is a necessary precursor to social progress, and the movement envisions the creation of a utopian Christian religious totalitarianism. As Morningstar Ministries founder Rick Joyner writes, on Elijahlist, "The kingdom of God will not be socialism, but a freedom even greater than anyone on earth knows at this time. At first it may seem like totalitarianism, as the Lord will destroy the antichrist spirit now dominating the world with "the sword of His mouth" and will shatter many nations like pottery. . . the kingdom will move from a point of necessary control while people are learning truth, integrity, honor, and how to make decisions, to increasing liberty so that they can." 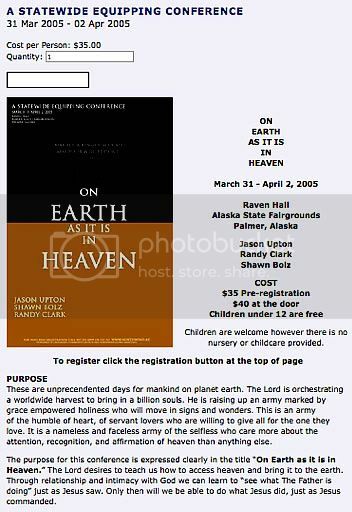 The Wasilla Assembly of God has extensive ties to Joyner's ministry and in October 2008 Morningstar Executive Vice President and Head of Prophecy Steve Thompson was scheduled to head a prophecy conference at the Wasilla church. Recently, New Apostolic Reformation leaders have begun to shift their emphasis, from “spiritual warfare” to the establishment of Christian dominion “in the natural”, that is the Earthly realm. In a short speech he made prior to his October 2005 anointing of Sarah Palin, Thomas Muthee called on Christians to take control of seven key sectors of society including business and finance, schools and education, media, and politics and government. In early September 2005, shortly after John McCain’s choice of Sarah Palin as a running mate in the 2008 Presidential election, roughly two and a half years’ worth of video and audio segments of recorded sermons and events held at the Wasilla Assembly of God from 2004 up through late 2006,, which had been available to the general public, were scrubbed from the Wasilla Assembly of God web site. A video segment of Thomas Muthee’s October 2005 anointing of Sarah Palin, fortunately saved and later reposted on the Internet by a blogger, was among the scrubbed video and audio segments. If not, I'd like to hear Mr. Bentley's response to his "holy kick in the gut" not only futile, but extremely mean and manipulative action. I'm sure his answer would astound me. These are very scary people. But I'd like to know too. I am very eager to know how is new format of the because now we can say technology is used in the highly sense hearts card game online which make it very better then the other other formats which we have used in the hearts card game online free.